Simon Palmer studied illustration and graphic design at Reigate School of Art during which he was encouraged by his tutors to pursue landscape painting. 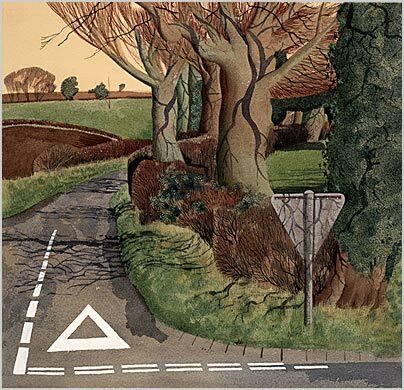 He worked for a while in Kent but returned to his birthplace of Yorkshire where he is now based near Masham. His enigmatic & captivating paintings pay homage to the people and landscape of Northern England. His paintings effectively marry present day reality with the equally interesting realm of his imagination transporting us into a world filled with intriguing characters and situations. It is this narrative quality coupled with his wit that has meant Simon’s work has attracted a large following from art collectors both at home and abroad. “Palmer's work recalls the tonal qualities of William Morris in his muted earthy hues, and has a calm tendency towards surrealism reminiscent of Stanley Spencer as he presents his unfathomable situations”. Simon's originals go to exhibition every 2 years in London through his agent JHW fine art. We are pleased to offer these prints and signed books. But do contact us for the availabilty of any originals or to commission Simon. These images have been exclusively produced by Simon to sell through The Gallery. They are limited edition giclees of original watercolours.